Citation Information: J Clin Invest. 2012;122(8):3002-3011. https://doi.org/10.1172/JCI59832. Bacteria versus neutrophils: 4 plausible behaviors. Red regions correspond to experimental B and N concentrations that lead to an increase in the bacterial population (B locally wins); blue regions correspond to concentrations that lead to a decrease in the bacterial population (N locally wins). (A) Ratio-dependent models propose that the initial B/N ratio determines the result (6–8). (B) The neutrophil-threshold model proposes that a single neutrophil threshold exists, below which the bacterial population grows, and above which the bacterial population decreases (9, 10). (C) Monostable models propose that when the bacterial natural growth conditions are mild, the presence of neutrophils leads to a gradual decrease in the bacterial maximum capacity, down to extinction (11). 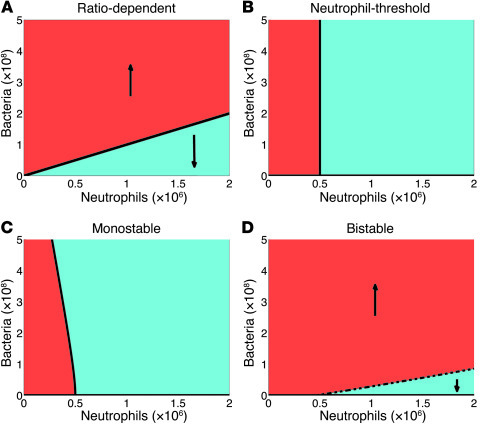 (D) Bistable models propose that when the bacterial natural growth conditions are more favorable, the presence of neutrophils leads to bistable behavior (see Figure 1 in ref. 11). Here, we focused on the experimentally relevant region. The BNC (dashed and solid black curves) separates regions of bacterial growth from regions of bacterial decrease. Only in the bistable case (D) does the BNC have a positive slope, not conserving the B/N ratio.